Enjoy titillating discussion surrounding C.S. 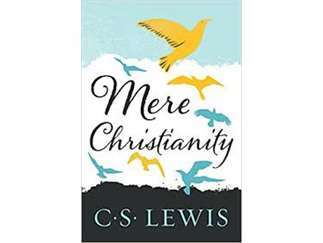 Lewis's book, Mere Christianity. This book is intended for all audiences and explains the fundamental's of Christianity at it's core, while avoiding the controversies of the individual sects. In plain language it describes the common ground which all Christians share, while avoiding most of the theological jargon which people often find confusing. Each week a delicious meal will be provided as well as childcare (with adequate notice). We truly honor your time and ours so we will always finish on time at or before 7:00 PM. We have a few extra copies of the book if you'd like to borrow one. First come- first served. Please let the office know when you call, that you'll be needing a book. These are gently used copies and can also be purchased for you to keep at $5. Cost: A free will offering to help cover food and childcare will be taken up each week, however not required for participation.